A global idealistic project with focus on peace and healing of Mother Earth, started in Oslo, Norway, Saturday the 21st of October 2006. 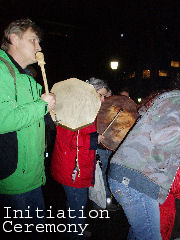 The initiation ceremony took place in front of the Norwegian Parliament. Because of a very late permission from The Parliament we could not inform about where the ceremony was to take place until the day before. Despite this and heavy rain, about 120 people participated. The World Drum carries a feather of an eagle and a little skinbag filled with powerobjects in the back. It is possible for the participants to give a gift of honour to The Drum and let it follow the travel. The ceremony focused on healing of Mother Earth and that changes must start within each and one of us. 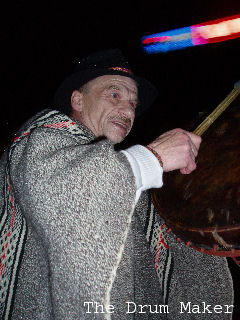 The World Drum, along with many other drums, made a forceful and energetic atmosphere. This first ceremony of The World Drum, was a initiation ceremony. 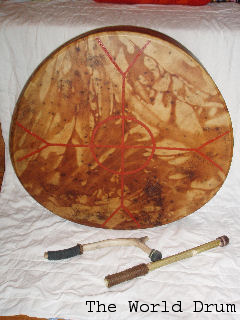 The World Drum is a symbol of life and that all parts in the web of life are connected together. All participants filled The World Drum with love and force, and with a prayer that we all must co-operate to keep a living earth in balance between nature and mankind. Humanity is close to destroy the web of life, it has started to come undone and the consequences will be catastrophic. A strongly increasing critical mass will not any longer sit still and see that our common place of living is to be destroyed and exploited of resources because that money and power is decisive in all matters. We are all human beings, without regard to race, religion or political conviction, and we all live on the same planet, Mother Earth. We are all depending on Mother Earth to continue our existence. This critical mass will no longer tolerate that our descendants will have to take over a planet in such a condition that existence of the human race will end. It is critical now, and we must stop. We cannot keep on seeing everything in the perspective of the ego. Instead we must seek a deeper truth and think totality, as the web of life really are. We have in our power to create a splendid reality with love, harmony and co-operation between man, and between man and nature. The World Drum is to be a wakeup call to humanity and get them out of lethargy and indifference. We must all get together in a last common "war", a "war" for the continuing existence of humankind and where love is the only weapon allowed. "As The World Drum travels, the sound of it will get stronger each day. It is the sound of heartbeat and life itself"
The World Drum Project would like to thank all of You that so far have signed on to participate. And we would be very pleased if You all could add a link to our site: www.theworlddrum.com on your own web-site. More information is to come and our website will be updated as soon as we manage. And to your information, I am not a genious at web and computer, but I will learn. Also I have tryed to attach the pictures that originally was in this information.